Patient satisfaction surveys are increasingly being used to assess the quality of care provided by orthopedists following total joint arthroplasty (TJA). 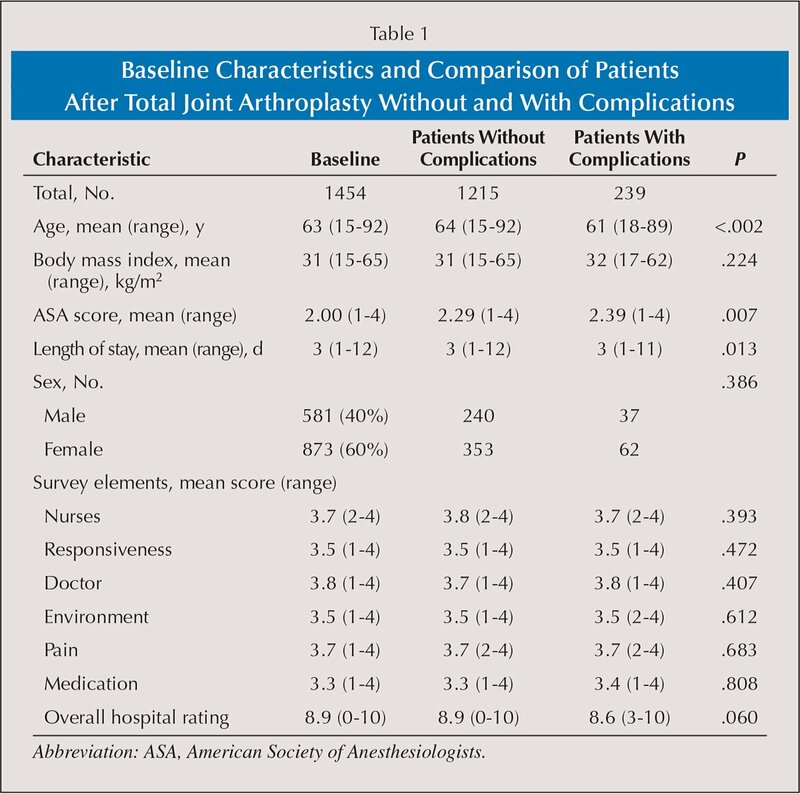 The success of TJA, whether total knee arthroplasty or total hip arthroplasty, can be better understood using standardized questionnaires to assess patient satisfaction. Several commonly used standardized questionnaires assess outcomes and joint-specific parameters, including rehabilitation, function, and pain.1–5 However, the Centers for Medicare & Medicaid Services (CMS) is placing greater emphasis on patient satisfaction surveys and has incorporated such metrics into reimbursement models, linking their results to employment and salary.6 Furthermore, the CMS is quantifying and incentivizing higher standards of care through the implementation of Value-Based Purchasing.7–9 Using this model, hospital reimbursements are becoming dependent on the quality of care provided as described by these satisfaction questionnaires. It is uncertain which facets most affect survey scores among patients who have received TJA. Therefore, the authors assessed (1) which features of the Press Ganey survey affected the patients' overall hospital rating and (2) whether the occurrence of complications impacted the Press Ganey score. The results of this study, highlighting the importance of recognizing the factors that may affect patient satisfaction, are likely to be relevant for most US orthopedic surgeons and institutions. The authors queried the Press Ganey database for all patients who underwent in-patient procedures at their institution with diagnosis-related group code 470 (major joint replacement or reattachment of lower extremity) between November 2009 and January 2015. Institutional review board approval was obtained as needed. The database contains information related to American Society of Anesthesiologists scores, Press Ganey question responses, and demographics (Table 1). The study was based on 7 domains consisting of 1 to 3 questions each (Table 2). A total of 1454 patients underwent TJA during this period. They had a mean age of 63 years (range, 15–92 years), with 873 (60%) being women and 581 (40%) being men (Table 1). Multiple regression analyses were performed to identify which individual Press Ganey domains (communication with nurses, responsiveness of hospital staff, communication with doctors, hospital environment, communication about medicines, and pain management) had the greatest influence (beta weight) on overall hospital rating (the dependent variable). The weighted mean for each domain was calculated. Length of stay, demographics, American Society of Anesthesiologists score, and survey responses of patients with and patients without complications were compared using chi-square analysis and the Student's t test as applicable. Results were computed using a Microsoft Excel 2010 spreadsheet (Microsoft Corporation, Redmond, Washington). Communication with nurses (beta weight=0.434, P<.001), responsiveness of hospital staff (beta weight=0.181, P=.001), communication with doctors (beta weight=0.115, P=.014), and hospital environment (beta weight=0.100, P=.039) had a significant positive influence on overall hospital rating (Table 3). The remaining domains (communication about medicines and pain management) were not statistically significant. On comparison of patients with complications with patients without complications, there were no significant differences in Press Ganey survey scores (Table 1). The overall hospital rating was high (average, 8.9; rating scale, 0–10). As health care reform continues, ways of determining the success of various orthopedic procedures and providing care are evolving. Patient-reported outcome questionnaires, such as the Press Ganey survey, are currently being used to assess and report patient satisfaction as a measure of quality. However, the parameters measured in these surveys may not correspond to the joint-specific parameters measured in commonly used questionnaires that assess quality of life, function, pain, and rehabilitation.1–5 Moreover, with increased focus by the CMS on the use of the Press Ganey survey to measure patient satisfaction as a tool to determine reimbursement rates, it is vital to understand the aspects that guide and influence patient responses. Inconsistencies between commonly used TJA-oriented questionnaires and CMS-mandated patient surveys such as the Press Ganey may result in lower reimbursement, even in the presence of sufficient and quality care. Therefore, the authors sought to determine which factors most influenced scores among patients undergoing TJA. Specifically, they assessed which features of the Press Ganey survey affected the patients' overall hospital rating and whether survey scores were disparate between patients who did and patients who did not have complications. The results of this study indicated that overall hospital scores were positively influenced by communication with nurses, responsiveness of hospital staff, communication with doctors, and the hospital environment. However, there were no significant differences in Press Ganey survey scores between patients who did and patient who did not experience complications. These results suggest that the Press Ganey survey may not be adequate for determining quality of care among TJA patients. This study had several limitations. The Press Ganey survey accounts for subjective question domains; it does not incorporate external factors that may influence patient responses. For example, pain control in the period immediately after TJA, which continues to pose a challenge for orthopedists,14,15 may be negatively perceived by patients as insufficient care and inadequate effort by providers if ineffective. This may ultimately result in unfavorable satisfaction scores for various question domains, despite patients' having achieved successful outcomes. Additionally, Press Ganey survey results were not compared with functional outcomes after TJA. However, this study incorporated valuable elements from the Press Ganey survey that have been previously described14,16 and also offered insight into patient satisfaction after TJA. Because the aspects analyzed may vary between regions and institutions, the results of this study are not generalizable; however, they may offer a baseline for future studies. Several studies have reported the influence of hospital staff on the results of Press Ganey surveys. In an analysis of 736 primary total knee arthroplasty patients from a Press Ganey database, Chughtai et al16 showed that the overall surgical experience was significantly influenced by patients' perception of their nurses (beta weight=2.2, P<.0001) and orthopedists (beta weight=0.3, P<.0001). They noted that patients' perception of pain management also influenced the overall surgical experience; however, this was not statistically significant (beta weight=0.2, P=.2). Similarly, Mistry et al14 showed that patients' perception of nurses (beta weight=1.31, P<.001) and orthopedists (beta weight=0.47, P=.006) had a significantly positive influence on overall hospital satisfaction in their analysis of 692 primary total hip arthroplasties from an institutional Press Ganey database. They also noted a non-statistically significant (beta weight=0.2, P=.262) influence of pain control on overall surgical experience. In a study of Press Ganey surveys from a large, tertiary pediatric emergency department, Locke et al17 showed that the odds of having a favorable overall hospital satisfaction rating were significantly impacted by the care provided by nurses (odds ratio, 4.60; 95% confidence interval, 2.17–9.73). Wolosin et al18 showed that a 1-point increase in nursing score would result in a 27% probability increase in the overall hospital rating, whereas a 1-point increase in physician score would result in only a 5.6% probability increase in the overall hospital rating. Contrary to the current authors' findings, there are studies showing an association between pain management and patient satisfaction scores. In a prospective analysis of 441 surgical inpatients, Buvanendran et al19 showed a negative correlation between the patients' pain rating and satisfaction scores (r=−0.3, P<.0001). Moreover, using the Medical Interview Satisfaction Scale, Downey and Zun20 showed that a decrease in pain score of 40% or more was linked to increased patient satisfaction scores (all P≤.03). Because surveys such as the Press Ganey are increasingly being used by the CMS to determine reimbursements to providers and hospitals, orthopedists must understand the factors that may affect scores following TJA. The authors' findings indicated that overall hospital ratings after TJA were most influenced by patients' perception of communication with nurses, communication with doctors, responsiveness of hospital staff, and the hospital environment. Moreover, there were no significant differences in Press Ganey survey scores between patients who did and patients who did not have complications. By recognizing these elements, physicians can direct measures appropriately and provide simple, successful interventions such as encouraging positive interactions between nurses and patients, fostering a more positive working environment, and enhancing communication between physicians and nurses. This proactive approach may help avoid financial penalties and, more important, may increase patient satisfaction after TJA. Binkley JM, Stratford PW, Lott SA, Riddle DL. The Lower Extremity Functional Scale (LEFS): scale development, measurement properties, and clinical application. North American Orthopaedic Rehabilitation Research Network. Phys Ther. 1999; 79(4):371–383. Chughtai M, Jauregui JJ, Mistry JB, et al. What influences how patients rate their hospital after total knee arthroplasty?Surg Technol Int. 2016; 28:261–265. Communication with doctors Doctors treat you with courtesy/respect? Doctors explain in a way you understand? Doctors listen carefully to you? Communication with nurses Nurses listen carefully to you? Nurses explain in a way you understand? Nurses treat you with courtesy/respect? Responsiveness of hospital staff Help toileting as soon as you wanted? Call button help as soon as you wanted it? Pain management Pain well controlled? Staff do everything to help with pain? Communication about medicines Staff describes medicine side effect? Staff tell you what new medicine was for? Hospital environment Cleanliness of hospital environment? The authors are from the Center for Joint Preservation and Reconstruction (JBM, CUG, RED), Rubin Institute for Advanced Orthopaedics, Sinai Hospital of Baltimore, Baltimore, Maryland; the Department of Orthopaedic Surgery (MC, AK, PR, NSP, GM, MAM), Cleveland Clinic Foundation, Cleveland, Ohio; and the Department of Orthopaedic Surgery (SFH), Icahn School of Medicine at Mount Sinai, New York, New York. Dr Harwin was not involved in the peer review of this manuscript. Drs Mistry, Gwam, Chughtai, Khlopas, Ramkumar, and Piuzzi have no relevant financial relationships to disclose. Dr Muschler is an unpaid consultant for Parker Hannifin, has received research support from Fortus, and receives royalties from Fortus. Dr Harwin is a paid consultant for Stryker and Convatec, is on the speaker's bureau of Stryker and Convatec, receives royalties from Stryker, and holds stock in Stryker. Dr Mont is a paid consultant for DJ Orthopaedics, Johnson & Johnson, Merz, Orthosensor, Pacira Pharmaceuticals, Sage Products, Inc, Stryker, TissueGene, and US Medical Innovations; has received research support from DJ Orthopaedics, Johnson & Johnson, Ongoing Care Solutions Inc, Orthosensor, Stryker, and TissueGene; and receives royalties from MicroPort and Stryker. Dr Delanois is a paid consultant for and is on the speaker's bureau of Corin. Correspondence should be addressed to: Ronald E. Delanois, MD, Center for Joint Preservation and Reconstruction, Rubin Institute for Advanced Orthopedics, Sinai Hospital of Baltimore, 2401 W Belvedere Ave, Baltimore, MD 21215 ( delanois@me.com).